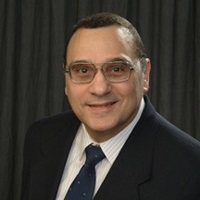 Dr. Robert J. Lopez, Emeritus Professor of Mathematics at the Rose-Hulman Institute of Technology in Terre Haute, Indiana, USA, is an award winning educator in mathematics and is the author of several books including Advanced Engineering Mathematics (Addison-Wesley 2001). For over two decades, Dr. Lopez has also been a visionary figure in the introduction of Maplesoft technology into undergraduate education. Dr. Lopez earned his Ph.D. in mathematics from Purdue University, his MS from the University of Missouri - Rolla, and his BA from Marist College. He has held academic appointments at Rose-Hulman (1985-2003), Memorial University of Newfoundland (1973-1985), and the University of Nebraska - Lincoln (1970-1973). His publication and research history includes manuscripts and papers in a variety of pure and applied mathematics topics. He has received numerous awards for outstanding scholarship and teaching. rlopez has a reputation of 2428. What is reputation? Addendum to "A Solution to the Constrained Minimization Problem"